In what could have easily been a trap game for a team that has been rolling but has a huge matchup this weekend, the No. 8 ranked ECU baseball team didn’t show any lack of focus with great small-ball execution. ECU (25-7) traveled to Brooks Field in Wilmington and defeated in-state rival UNCW (17-16) 9-1 with a small ball dominant game. ECU laid down three sacrifice bunts and scored five runs in total with outs. Lane Hoover got it started by scoring on a passed ball to give ECU an early 1-0 lead in the first inning. Brady Lloyd laid down the first of the three sac bunts in the second inning to score Dusty Baker. ECU was then off the scoreboard until the sixth inning, when Bryson Worrell grounded into a fielder’s choice that scored Spencer Brickhouse. Then Seth Caddell laid down the second sac bunt in the sixth, this time scoring Turner Brown. The next inning, Hoover got down the final sac bunt and scored Nick Barber to make the game 6-1. Chandler Jenkins grounded out to the pitcher in the eighth, a play where Jake Washer scored, and then Worrell scored on a wild pitch in the inning. Brown and Thomas Francisco were the only players to bring Pirates home with a hit. Francisco hit an RBI single in the second inning to score Washer, while Brown singled home Christian Jayne in the ninth inning for the final 9-1 margin. “We’re just coming out here and trying to execute our plan. If it comes with small ball or big-time hits, you’ve got to find a way to win. I thought that’s what we did tonight,” Francisco told Hoist The Colours. Just like it did against Duke last week, ECU made its midweek game a bullpen game. Trey Benton got the start (and his third win of the season) but went just 2.2 innings. Sam Lanier came in and threw 2.1 innings, and Cam Colmore (1.2), Evan Voliva (1.1), Zach Barnes (0.2), and Garrett Saylor (0.1) all threw in relief. UNCW also used 10 pitchers in the game, making 16 total between the two teams. While it seemed Benton’s 2.2 innings wasn’t a long start, no other pitcher matched that many outs in the game. Benton struck out a season-high six batters and only allowed four hits. The only run he gave up was a wild pitch in the third inning. After a terrible outing against Marist, Benton didn’t pitch for two weeks. Since then Benton has pieced together three consecutive good outings. Benton told Hoist The Colours that extra time with Godwin and pitching coach Dan Roszel helped turn his performance up. “We’ve been working on the delivery a little bit because I think it was easy for hitters to pick up early in the year, and started throwing more of a slider which is more sharp and easier for me to command. Those two have helped me be more in the zone and get more punch outs,” Benton said. 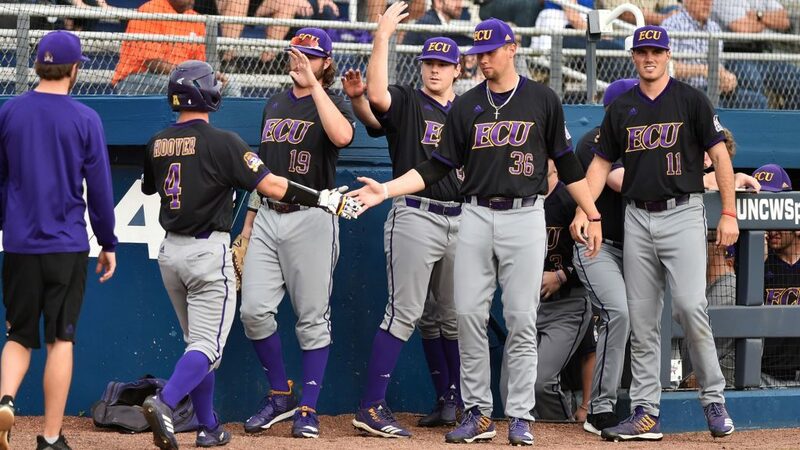 ECU was able to exact revenge on the in-state rival who ended their season in the Greenville Regional last postseason at Clark-LeClair Stadium, after a weekend full of rain and bad weather. The Pirates could have easily overlooked a UNCW team that is just above .500 on the season for a weekend series against No. 1 UCLA in Los Angeles. ECU was playing without star outfielder Bryant Packard for the second consecutive game, but Godwin said he expects Packard to play this weekend against the Bruins. “I’m just proud we came and played good baseball, that’s what we try to do. The media wants to make a big deal that it’s a trap game. It’s a rivalry game. If you don’t come here and play well, you get beat. It’s a tricky game because it’s a rivalry game. You’re going to get their best blow and I thought we fended that off pretty well tonight,” Godwin told Hoist The Colours.